Pope John Paul II’s window on Franciszkańska Street in Krakow, Poland. 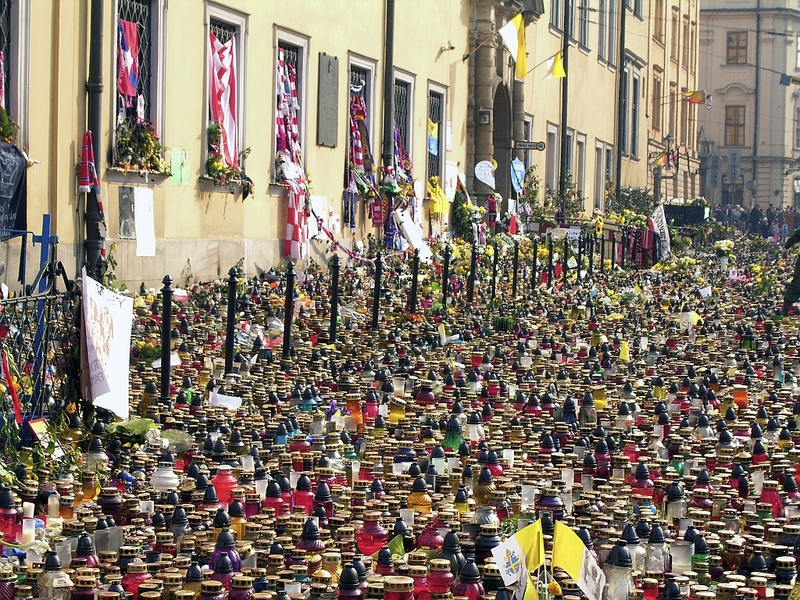 Krakow – a heartfelt tribute to Pope John-Paul II, a Pole who has become a symbol of hope and post-communist Poland. this is no time to be raising our voices against others, starting arguments, or becoming involved in wanton destruction. We shouldn’t look to overcome hatred with insults and even greater hatred, meet violence with more violence, or fight terror with even greater terror. There’s a name for our response to a world at war: it’s called friendship, brotherhood, communion, family […]. Today we adults need you to show us how to live together in diversity, dialogue and sharing, seeing multiculturalism not as a threat but as an opportunity: have the courage to teach us that it is easier to build bridges than walls! This is something we need to learn. Together we ask that you challenge us to follow the paths of fraternity. And build bridges. Do you know the first bridge that has to be built? It is a bridge that we can build here and now – by reaching out and taking each other’s hand. So take courage and do so right now! 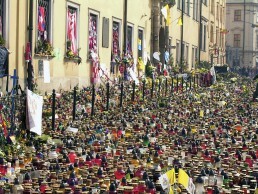 as part of the World Youth Day in Krakow. Pope Francis – Jorge Mario Bergoglio, born in 1936 in Buenos Aires, one of five children of Italian immigrants, is an Argentinian priest, the 266th Bishop of Rome, the Catholic Church’s Holy Father; he took the name Francis following his election on March 13th 2013. Previously, he was the Bishop of Buenos Aires and a cardinal. He is the first pope to be a Jesuit monk, the first pope from beyond Europe since the Syrian Pope Gregory III in the 8th century, and the first to come from the American continent. He is also the first pope to take the name Francis – to commemorate St. Francis of Assisi, the patron saint of the poor, who “taught us deep respect for all God’s creatures and urged us to protect the environment, which too often, even if sometimes our intentions are good, we greedily exploit to the detriment of others”.